WEEK 8 Update: My week 8 email update included the wrong link which brought you back to this post. Sorry about that. Please click here to go to week 8’s word of the week. Be sure to print it and post it everywhere! You can download in a PDF or in MSWord. Share Your Thoughts: As you read Chapter 7 , are there sentences or verse you’ve underlined or highlighted? Click “Share Your Thoughts” below to give your answers. Renee Swope is a Word-lover, heart-encourager and grace-needer. She's also a wife, mom and author. Her book A Confident Heart received the Retailers Choice Award and became am international best-seller that has been published in six languages, with over 150,000 copies sold. Renee served in leadership at Proverbs 31 Ministries for over 20 years and was the co-host of the P31 radio show, “Everyday Life with Lysa & Renee, for ten! She is a popular national conference speaker and serves as a contributing writer for DaySpring’s inCourage blog. Hi Renee, you may remember I am in Australia giving your books to girls here and personally mentoring some of them through it a chapter a week. I just had to tell you that my friend today gave her heart to Jesus with the prayer you gave in Chapter 2! I am tickled pink. Your book is such a blessing to women who are connecting to your story and realising they are not alone in their struggles. This book has been a wonderful resource for the brand new ministry God has led me into for helping women and I didnt really know how to get to the “accepting Jesus” part (this was my first one), but your book did it for me and her and I just thank you so much for it. You are such a blessing, more than you could even realise i suspect. Even all the way down here! Blessings to you Renee. You will remain in my prayers. WOW, Fiona!!! I just read your note. And then I read it out loud again, to my husband and my two sons who are 14 and almost 17. We are all so very blessed by the news you shared!! We rejoice with you and your friend and celebrate with the angels in Heaven that God’s family just got bigger today. So thankful for your heart and your obedience to share the love and life of Christ with women. I am so very honored to be part of what God has called you to — and so humbled that He would use someone like me to join someone like you in His Kingdom work. Bless you sweet sister in Christ – and we’ll be praying for many many more to come to know and fall in love with Jesus in the days ahead!! It is so funny that you say that Renee, because I told my friend that Heaven was throwing a party right now becuase of her! I am also feeling very humbled and thanking and praising God for using someone like me to join someone like you in His Kingdom work! Thankyou again for your beautiful heart and your wonderful book! I so agree. I look forward to it each week and I could reread things in the book as a reference. I’m going tthrough the flu right now and not able to catch up but I know the book is there waiting on me. I had just had too much time sick today in bed to think of too many negatives and doubts and it’s still hard for me to figure out what is from God and what is Satan putting out to deceive with. The word conqueror helps me as I have so much to get done in the next 6 weeks deadlines to meet and I’m all alone. I will cling to this verse. Jennifer, you are not alone. You have Jesus with you, the Holy Spirit living in you, and us gals in this Bible study right there beside you in thoughts and sending up prayers for you. Yes, as a conqueror with His help, you will get everything done. Yes, cling to Jesus and His promises. We love you and may your body be healed. Trust in Him. Praise God for clarity and open hearts. May your ministry florish! WOW Fiona I am rejoicing with you my Sister In Christ. We serve an awesome God. Keep up the good work and thanks for being there for the sisters in Austrailia may God Bless all of you. Thanks so much for the encouragement. It really blesses me. God bless you all too. Renée, you asked us to share from questions 1, 2 and 3 today. In question 2, you asked if I had ever felt that my failures were final or fatal. Well, what I’m about to share with you is shameful and scary for me, but I feel I must share it…Just recently, I had a very painful argument with a friend I am very close to. She began hurling remarks at me, using very personal information I had told her in confidence, and twisting it to make me look evil. It pushed every button from my childhood, because my dad used to do that to me. I got so inflamed and angry that I tried to slap her. Now, I have never resorted to physical violence with anyone in my life, not even my own child, so I was completely shocked at my own behavior. I grazed her cheek but missed slapping her.I left her house after that. The next morning, I wrote her a letter, making an amends for slapping her. She told me she could no longer be friends with me, but over time, we have been texting one another and emailing each other. However, she won’t see me. I feel that what I did was worst than anything I have ever done. I’m so ashamed. I have repented to the Lord, but I don’t feel like it’s enough. I am filled with shame. Satan tells me that I am the dregs of the earth. I want to show my friend how much I love her and how sorry I am for what I did, but she won’t see me. So, I continue to feel this deep seated shame pain. Reading the passage in John where Jesus writes in the sand reminds me of a devotion I have used with the youth on the shores of the Carolina beaches. I have them write in the sand their struggles or their doubts and we leave them there and give them to God. After the tide rolls in, those things we have written are washed away. It is a beautiful illustration of how God takes our imperfections and makes us whole again. He is a God of second chances. Through his love, mercy and grace we are more than conquerors of self-doubt. Rebecca, i love your illustration of (us) writing in the sand and the tide washing doubts, fears, etc, away. I am going to share with my family. Thank you for sharing with us. Thank you for sharing this Rebecca I love the illustration and will have to keep it in mind. I think sometimes I doubt not myself but situations I’m in. I have to figure this out. I was glad to see that you used someone who is single and not yet married (page 121) as an example of how we might feel like a failure as everyone else around us is moved onto the next phase while I seem to remain in the same phase, year after year after year. It is so unbelievably painful. I am reading this book and praying I can really apply it to myself so that I won’t let my singleness define the way I see myself….and to get to a place where my trust in God and his plans for my life outweigh the fear, the longing and the loneliness. I also really liked how you wrote on page 126 that God convicts but doesnt condemn us. There is a huge difference between the two and it has been an eye openener for me to stop living with such a guilt based faith. Connie, my 29 year old daughter is single, too. She sometimes feels like you do. She is strong in the Lord, so I don’t worry too much. I will pray that He will send you a godly mate. Keep claiming the promises that Renee has provided for us. It is incredibly difficult to not fit into what many in society, especially those in the church, see as a woman’s role. I too was grateful to see singleness mentioned; it seems like many books for Christian women focus on the wives and mothers and their challenges. I am a single 41 year old who has actually never been on a date which makes me feel like a huge failure. It is difficult to deal with because the reality of my situation is that I really am not good enough for that. It has been proven over and over. In some ways society itself already has labeled me as a failure and a misfit, and I repeat those messages to myself over and over. I struggle with understanding why God would not think that I was fit to have children of my own when there are so many people around me who are able to have kids. It is painful not to be included in the small group at church with people my age simply because I am not married and do not have young children like they do. Our lifestyles are just too different. It hurts that they do not see that they are being exclusive. I know that I need to keep trusting that somehow God will lead me to the place he wants me to be and to the person he wants me to become. I love the part of this chapter that talks about Peter and the fact that Jesus knew about his past and future failures and chose to look beyond that. I also like the idea of failing forward and of using failure to become stronger and better people. Jennifer, may i be bold and ask: would you be willing to step out and start a group (even 1) for singles? Others may feel like you do, but are hesitant to come forward. You have been bold in sharing your feelings. Maybe God is whispering in your ear. You are good enough! Keep referring to the chart: Who I Am In Christ on page 107 and 108. God has a Plan for each and every one of us and that is for you too, Jennifer. You are beautiful in His eyes, inside and outside. God made you just the way He wanted you to be. He Loves you and we love you, Jennifer. I can relate to absolutely everything you wrote. I feel those exact emotions and it is so true…society does label us as ‘mis-fits’ and even in the church, it seems there is no place for ‘single’s’ who are older in age. It is an extremely harsh reality to live with. I know that I have spent the last few years being consumed by it all….its hard not to when everything is a reminder that you are on your own. But I pray for the both of us that we can trully believe in our hearts that we are ‘worthy’ to be loved and that God’s love for us will satisfy our needs. I pray that we can see ourselves the way God see’s us. And I pray we can feel hope for the future, regardless of what it brings. I can see where you are coming from. I’m newly single. Yes again. another mistake, at 48. I met someone online that feels like a soulmate and he is also a Christian. I do not go to church regularly and i think I got that way when I just didn’t want anyone to ask me how was I doing or kids doing, (they don’t talk to me at all as adults now and I have no clue), and now this time, I really feel awkward in the church. There was a church in one city I lived that had a singles group and most were younger. It is definitely a need out there for older singles. Some of us don’t know if we are supposed to stay single, or get remarried and if so, does being a Christian automatically mean a marriage will survive? I know God satisfies our needs and if we are not marrying for children anymore then what are we doing it for. I woke up with alot of questions today. Dear Jennifer, I have been all the places you have in one way and another. If advise is what you want I would say you need to rest in the Lord. The illustration that Renee gave at the beginning with the vase and the stuff is so true. Fill all your emptiness with God. May I also suggest Lysa TerKeurst’s book “Made to Crave”. It is has a food aspect, but Men or Food it is all the same. We need to be filled with God. It is hard and I will praying for you to find some women in your area to support you. I would ask you to look into your Crisis Pregnancy Center for women of God who are not interested in being match makers, but giving the truth to a lost and dieing world. They may help you with a church that will help you too. A pastor who peaches the word, a supporting group of women and keeping in touch with Proverbs 31 ministry. The ladies here are so helpful and at hand. Jennifer, I’m sorry you are going through that, I have been struggling with some of the same things. I have never been on a date. It’s been hard because I start to wonder, i’m not pretty, not good enough. Thank you for the kind words and encouragement. I know that I am very fortunate in life and that there are many women in different places both in the U.S. and around the world that are in much more difficult situations. That knowledge makes me feel even worse when I start to feel discouraged. It is just hard sometimes to not fit in. I realize that I can’t change the way the world thinks; I can only change the way that I think and react. Some days I’m better at that than others. I loved the Carnegie analogy of gold mining. Even though there is so much dirt – you never go in looking for the dirt but the look for the gold! The more we look, the more we find. I have been feeling much of conqueror lately. challenges at work, and with family members. I’ve been revisiting my past, flashbacks of growning up in a alcoholic home, having an alcoholic parent, since I started the reading, and I was wondering if anyone are experiencing or have had similar experiences? I found book title “Perfect daughters”…and I fit the profile explained in the explained book. I know now that a lot my insecurities come from the experience of growing in an abusive enviroment and having an alcoholic parent. My dad was a highly functional alcoholic and he was great when he didn’t drink, but when he drunk he was abusive to my mother, sister and me. DF, So good to read that you are conquering! I, too, relate to the “Perfect Daughter” profile. Sadly, there are too many of us. Our advantage as daughter’s of the Holy God is His power – the Holy Spirit within us! 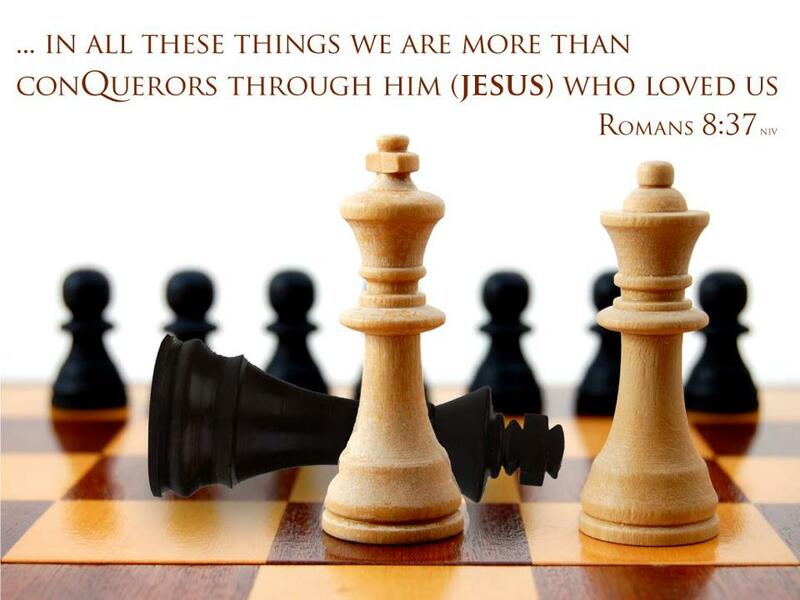 He makes us MORE than conquerors!!! Yes, it’s a day-to-day life but as we live more triumphantly each day in God’s provision and power, we have better things to look back on to encourage us as we look forward! phew! God bless you, sweet sister. May today be filled with much beauty and blessing and encourage you as you move forward in His holy power! I feel the same way when reading it. My timeline could fill a poster. I just in Microsoft Word where only I could see it wrote out my feelings of why I am what I am today and what my insecurities are and why I beieve them to be and in doing that I started remembering more than what I wanted to with my father who is still alive today and has asked for forgiveness and I did forgive him 2 years ago, but there is still a part of me that doesn’t want a relationship with my parents because I don’t want to remember again. My father basically molested me and my mother watched and did nothing about it but apologize for him. To me that is sick. I have more of a problem with her now than with him. She still tells white lies to my own kids and has split the family apart and what is worse is she strongly believes she is a Christian and does no harm. So mind-boggling things come to mind. It is mind boggling. I AM SO SORRY for your pain Jennifer D. Somehow God can bring those memories to a place of healing for you. Can you choose to forgive your mother and tell her so? Has she been confronted with the truth of her participation? God has planned healing for you in this. He is using Renee’s words, heart, and obedience to bring us to these places of healing and reconciliation. He is powerful, all knowing, loving, and TRUSTWORTHY in the process. Take care, grieve, and work through this. YOU are worth it and your kids are worth it. I would love to know more about the perfect daughter. I, too, grew up in an alcoholic family. I have been wondering this week how far reaching this sin in a family goes. I married a child of an alcoholic at 16/19. We trusted God, did our best, and of course were far from perfect. My email address is jasper7863@hotmail.com if you’d like to talk more. Put A confident heart in subject line so I open it if you do. but gives us power, love and self-discipline. Thank you so much Renee you are a big blessing to me. Reading your book , joining the bible study and listening to you give me encouragement to go on and pursuing God everyday and every way in my life. I am still struggling from reflux but I keep claiming His promise that all things are possible in Him. May our Good Lord bless you and your family more everyday in every way. I like the illustration “God is the gold miner.” I was reminded through this illustration how God saw the gold of His image in the Twelve Disciples He CHOSE. Twelve ORDINARY men with each carrying their weaknesses, sins, faults. Christ knew all their faults long before He CHOSE them; yet ,He CHOSE them. These twelve men did not let their past, present define them. Ladies…. (including me) we can not let our past, weaknesses,etc. define us! As Renee says in the book “we must allow God to write our stories”. I am finding so much healing and comfort in claiming God’s promises through A Confident Heart. That is where the healing balm is..in the power of God’s promises there for us! This is a moment by moment process I need to check where my focus is and with God “We can do all things through Christ , who strengthens us.” Phil. 4:13 Once again, thank you Renee for allowing God to use you all around the world! Praise God! I felt so sad as I read the pain of all our sweet sisters who feel that they are alone. Sometimes the pain of feeling rejected is so heartbreaking. I am feeling some of those same feelings at this new season of my life as both of my boys have gone off to college. I was a stay-at-home mom for the last 21 years and didn’t realize how much that had become not only my life but my identity. I’m struggling now to discern where God is calling me. I want so much to serve Him but I’m not sure where He’s calling me. Sandee: I am glad to know that I am not alone. I too am an empty nester and I am also struggling to figure out what God wants me to do next! My trouble is that I have too many options and something has to go but I’m not sure what. Or perhaps God wants me to do something totally new? And of course, along the way I am struggling with my self-confidence! But learning how to overcome this problem! Carol, that is exactly my struggle. I’m also involved in a lot of things but don’t feel called to give my whole focus to any one of them even though they are all good things. I’ve been trying for a long time to discern whether God is calling me to pursue making my writing more public but the self-confidence factor always tell me that what I have to say isn’t important or has already been said before. I just keep praying for wisdom and discernment. I will keep you in my prayers as well. I too am a new empty nester struggling to figure out where I fit in and what God has planned for me now. I believe God calls us to different seasons in our life. Stepping into a new season is at times confusing and painful in our own humanness. I am quick to feel I can’t do that or I am not as good as someone else.Trying to listen more to what God thinks of me as his masterpiece. Enjoy reading how God is working in all of you as well. Thanks everyone for sharing so openly. As I read all the comments I realise that we might be worlds apart but we all desire the same things; love, acceptance, affirmation and just knowing that you are chosen. I read a few weeks ago a comment from a married woman who said she feels rejected by her husband. I was also feeling quite rejected because I am single. I realised then that even though she is married and I am single we both feel rejected somehow so it occured to me that the devil will use a different weapon for everyone with the same reuslts – to get us to feel unwanted. I could hear the holy spirit saying “Mercy, if its not one thing its another” So I became determined that I will not let my situation define me or degrade me. I am precious in his sight. Lets continue to pray and encourage one another in christ. Thanks Renee for agreeing to be used by the Lord to touch so many lives in a profound way. I love the fact that no matter where we are on our faith walk, we can come here for support. Although I’ve been a Christian from birth, I never grew up studying Bible verses for my own use. This “A Confident Heart” book/Bible study has armed me with new ways to combat the evil one. Because of our obedience and commitment to this study, I’m sure I’m not the only one who has been tested more often in recent days. I thank God for all of the support that I get from all of you to stand strong. Thanks, Renee, for creating this online community. Praise God for We are More then Conquerors -ROMANS 8:37-39]Through Him that Loved us.I Thank God for the next verse As well.For I am Persuaded that NOTHING can harm us or Come Between us and Our Savior.He Loves us so much that His Word saids He goes before us to make it safe for us to Shield us from the fiery darts that try to come near us.And as Long as our Faith and Trust is in Christ we can make it.We will be VICTORIOUS OVER DEATH HELL AND THE GRAVE!!!!!! !And all you Precious Women of God know that your loved and your secured in Christ and nomatter how others see you God sees a Beautiful Masterpiece He created your worthy and your Vaulable.And He accepts us just the way we are.I am Praying for each and everyone of you and Remember that it is so Important that we as Sisters in Christ Pray for one onother and For Sister Renne the enemy will be raging more in her life because of the Dilverance she is causing from her Obedience in doing God’s Work.She needs ALL our Prayers.God Bless each and Everyone of you and your families. Thanks for this Online Study Sister Renee it has really cause me to grow more in my walk with Jesus.And to know I am Nothing on my on But I am Powerful in Christ. I want to thank you that through Christ you had the courage and wisdom to write “A Confident Heart” and I was led to the book and bible study. I feel I need to share my experience that has taken place through Jesus and this bible study, in hopes that I can be a witness and blessing to someone else, as to what God can do. Even though I was “approached” and saved 4 years ago(the key word being “approached”), I wasn’t seeking Jesus on my own. I by no means want to in any way disregard that devine entervention from God or my savation that took place, because it was in God’s perfect plan for me. I was changed for about 6mos. and then resumed my old lifestyle and was seperated from Christ and living a life of turmoil, doubt, insecurity, and struggleing with major conviction. Through this study, spending much time with God, doing the time line and confronting my past and present hurts in chapter 4( which was very enlightening and painful to say the least), I finally had the courage to face my demons and “Seeked”(the key word being “seeked”) God on my own with all my heart and broke down with everything that is in me, and begged God for forgiveness, and asked Him to take my life, I was giving it all to Him, I wanted Him to direct me and lead me in everything I do. He answered my prayers immediately. His Spirit was with me right there, as if He was sitting next to me, in me, and through me. It was amazing, beautiful, and extremely life changing. I know the spirit of Christ is living and dwelling in my heart in everything I do. He will never leave me. I am one in Christ, an amazing child of God. I can’t express in words how blessed I feel that God gave me His amazing grace and the overwhelming love, joy, peace, strength, hope, faith, and “confidence” I now have. I am seeing everything differently now, even reading the bible is new now. I am understanding and comprehending it like I never have before and can’t get enough of His word. Looking back, I know I was afraid to completely let go and give it all to God. I wasn’t letting Him work in me by completely having faith and trust in Him. Now that I am one with Christ, I see how amazing He is and what only He can do, if you just let Him, I never want seperate from Christ who is in me. Through His spirit in me I want to be an obediant, courageous servant. Thank you God for Renee and this bible study and giving me salvation through Your Son Jesus Christ. May God richly bless everyone in this study, as much as He has me. The reminder on page 122 that accusation does not come from God, but from the accuser really resonated with me today. I might have some difficulties or have some thoughts that do not agree with what God says about me. This is a reminder from chapter 6 that God’s thoughts are for me and not against me. It is also a reminder that Satan is out there and does not want me to be successful. Praise songs really help give the correct perspective!! I guess for me, the main thing that stands out is that these thoughts that come are from the enemy not God, I seem to have deep-rooted ideas about myself that I’ve believed for a long time, even after salvation, I kept believing the lies. I don’t want to do that anymore. I also feel just like you did as a mom. I homeschool. I have an 11, 9, and 4 year old. I’ve felt like a complete failure. I’m going to start trying to mine for gold instead of looking at their faults. I have been crying out to God for help. Maybe that is my answer. Thanks for sharing Renee. It is such a blessing that you have followers all over the world. It is exciting that you are a missionary to all these countries without even having to leave the US!. May the Lord continue to bless and use you for His service and His glory! This chapter was even more powerful for me than the last. I identify with Renee’s story about feeling like a failure as a mother. I wish I had failed forward with my feelings of doubt, but I struggled on trying my best as a single mom. Now I have learned that I was listening to my enemy and God was for me all along. The part of the chapter that stood out for me was the story of the woman caught in adultery. No one was left to accuse her and Jesus did not condemn her either. I am so glad that I know the difference between conviction and condemnation now. I can seek the Lord to help me identify my thoughts or actions that I need to change without fear of rejection. This is a wonderful lesson to begin walking in! For anyone who is counting…it’s me at Starbucks in California. I have DSL at home, but this is “my place” to rest between rushing to get my 16 year old son up and out for school and driving the next 15 miles for my class 3 hours later. It isn’t total rest, I also have 2 girls that are getting reading and driving themselves and not until 9a.m. when I know they are on the road to their classes do I take the big breath. I don’t even hear the words to the music, I just feel the rest and cheer of the staff here. Here…in the chat place with Confident Heart. A safe place we can cheer with our friend from Australia in the salvation of a new sister…encourage someone who is hurting…advise someone who is questioning. Color, Language, Style…we are all sisters in the family of God. We all come with stuff. Lots of stuff!!! 2Tim. 1:7 is my verse from chapt 6 too ~ JennB. Thank you so much for your teaching. I am learning to be a conqueror. I’m am working very hard to find what God has for me in overcoming the things of my past. God Bless You so much. “It was Peter’s faith in Christ as Messiah and his love for the Son of God that, despite his obvious shortcomings, gave him potential to be used by God.” These words really hit and have been a great reminder that it’s not about what I can do, but WHO God is!! Faith in Him is going to accomplish all He wants me to do! Then add love for Him to the equation and that gives the motivation to obey and follow where He leads! I can’t wait to come to “my place” here….. I am so bless having everyone of you. God bless all my Sisters in Christ. Love Ya’ll. Praise The Lord Fiona!! I am singing for joy over our new sister in Christ! There have been many blessings throughout my walk with Christ but, to be there when a sister accepts our Lord into her heart has to be one of the all time “highs”. I am so happy for her and I will be praying for her faith and that she will take up the whole armor of God. Ephesians 13-17. As we know she will need to gird her waist with truth, have the breastplate of righteousness and the shield of faith to quench all the fiery darts, the helmet of salvation and the sword of the spirit, which is the word of God. So, she can know that “in all these things you (she is) more than a conqueror through Him who loved (her) you. Romans 8:37. It will be a blessing to be faithful to pray for her. Thank you, ladies, for all of the inspirational messages. I don’t post often but love reading the posted verses and comments. I am starting to get that small sense of belief that maybe my past doesn’t really have to define my present and my future. If God is for me, who can be against me!! I am getting into the chapter tonight..and I can’t wait! Lenten season blessings to each of you. p.s…..’thank you’ Renee in advance! I love this chapter….it is one of the things that I have been learning in my life. Satan wants to derail us in any way that he can. Living in a M*slim country and ministering to a people group who are very resistant has it’s challenges and Satan’s lies are one of the things we have to battle with daily. I love our verse for this week and the song from Casting Crowns ” The Voice of Truth” The question that I try to ask myself when doubts arise is what is truth and what are Satan’s lies. Thank you Renee for sharing with us. This book is a great encouragement to me. Renee I thank God for using you in encouraging me every now and then. May your Ministry grow to help others who are worried. This is a perfect find for today…Thanks! For me, on page 123 “Setting traps is exactly what Satan does. He lures us into wanting something, and than he turns it around and accuses us on the basis of the very thing he enticed us with.” This is what hit me with so much truth. Coming from alcoholic parents and such a dysfunctional home, I have worked at this all of my 55 years of life. I have struggled with addiction all my life and I do believe it is one of Satan’s biggest weapons. It is in fact becoming epidemic in our country!!! I live in Florida and it is the worst state. I heard the other day on the news that FL is worse than all the states put together. Doctor’s freely give pain meds out to the max. I have never used the system by going to different Doctors but the one I have gives me pain meds as needed which is way to much than he should. I started a year ago on pain meds for my arthritic knees and before I realized it and it came to the place where I knew I was habitually sinning I was so addicted!!! In December I had a mental breakdown and sort of went crazy, without all the details, it was one of the worst experiences of my whole life. I thank God for the Godly woman, who is an addiction counselor in my church, God put in my life. She helped me wean off without me having to tell my husband or my 3 sons who knew nothing about it. I work as a companion to the elderly and go into many homes where pain meds are right in front of me…I love my work and feel I am called to do it by God. I go back now to the sentence I quoted …I will go into a home and see them and I just want them again…It is like trying to tame a lion as I just read in article about a famous actress who deals with it. When i get the script I am enticed and then beat myself up for doing it…As He does…Satan uses the very thing to turn around and use against me…I pray for the confidence in myself only God can give me and that I realize that when I am weak God is strong and He helps me get past the temptation…When I fail I try to fail forward and realize I have to learn from this life long lesson I have to learn over and over again…I am weary from it. I have thought of leaving this type of work so I am not tempted but I feel God is calling me to it…for many reasons…It is good for me to do for others, I feel so loved and appreciated after I leave a home, I am helping them and also He is teaching me self control when I am faced with the temptation…Help me Lord I hate, hate this battle and this cross to bear throughout my life….Thank you sisters for listening, my heart aches over who Peggy is sometimes…. In Chapter 7 I was reminded again to focus on the good (“Whatever is good, noble, …”) To look for the positive…and “think on these things.” I need to apply that to my children, others…AND myself (sometimes I forget that one.) Something that does help me is remembering that the LORD is the Author AND Finisher of my faith. He is faithful and will complete that which concerns me (and my children)…. When I lay my burden (and my head) upon His chest…and rest it there…listening to His heart of love….then I am comforted! God bless you too, Carla. I have struggled with the same lie that my life is a failure because I chose to stay home with my children and their lives have not turned out perfectly. But I know that realistically no one’s life ever turns out perfectly, no matter how wonderful the parents/environment/teaching etc. All have sinned and fall short of the glory of God. Thank heaven for God’s grace in sending us a Savior for that very reason. If anyone would like to be encourage through powerful messages that are perfectly aligned with our reading, visit North Point Church’s (Andy Stanly is the lead pastor) website: http://www.northpoint.org/messages. There is a two-part series titled Vengeance and a three-part series called The Comparison Trap that are excellent–well worth the investment of time to listen. As I took these in, it felt as if Andy and Rene had surely been working together to align the timing of this information. It simply reinforced for me the importance of this message to God for His people. I definitely like the gold miner analogy! Also relate to the smaller, everyday things as main source of “failure” right now. At times need to keep reminding myself that God does not condemn me for my past (or even present). He has forgiven me & is waiting for me to forgive myself & allow Him to use those experiences to work in & through me. I relate to chapter 7 as much as chapter 6. I very much have felt like a failure after separating from my husband four months ago, failing God as a wife and step-mother. I know this is not true, but it is how I felt. I am so glad God led me to my counselor and through her, this book and study. Some things I high lighted in Chapter 7 were, “Jesus also knew that her sin was not who she was. It was what she had done.” “God wants to give us a new starting place. He sees beyond who we are to who we are becoming.” “God’s Spirit will convict you, but His heart will never condemn you.” “Although it seems contradictory, failure can help us become the confident women God created us to be. It can make us stronger and better – if we go to God for help.” I like the failing forward, that “even when she falls, she doesn’t have to stay down. Instead she reaches for God’s hand and rises again.” Thank you so much for sharing your story Renee. I am hoping that, although I am a couple days late….someone reads this and can provide some suggestions to me. All my life I have been “busy”. I have come to realize that the constant running and doing was out of fear. Fear that my past will catch up with me and the awful nightmares and feeling of unworthiness and shame would catch up. I have found strength through this study and know that no matter how fast I run, God is with me. I have looked at my early years of life as a failure. I’m struggling to really truly embrace the thought that I can’t be responsible for the behavior of adults when I was a child. What verses or prayers have worked for you when you struggle with looking internally and feeling good about yourself and not a failure for what others have done to you? I want to slow down and really know and love God but am so afraid. I love what you shared Suzanne it is so true and an excellant anaogl to use. Thank you for sharing it. Wendy…just to share with you…ask the Lord to show you..when to meet with Him, for me He lead me to have a time I called “lunch with Jesus”….so I committed every Wed./even put it on my calendar ( just like we would with a lunch with a girlfriend..)…. trust me…you will want and desire more time, more days! !….He is just waiting to be with you! Praying for you, as when we are ‘still’…He draws you so close to give you His love, healing touch. # 2 Yes from the abuse I went through growing up I felt it was the end of my world. I let it define me by turning to alcohol and smoking and promosquity. After becoming a Christian I learned that I am free from past hurts and failures and God does not condemn me. From reading this book I was reminded how failure produce wisdom. As long as we are open to learning from them. I have learned plenty from mine, God’s path is definetly the better path to take. # 5 condemnation brings down and causes shame and guilt to control us. conviction builds us up and causes us to change our ways with the help of the Holy Spirit. This weekend I am going away. My husband and i will be helping our teen ministry drive the teens to the mountains for their winter teen camp. Then we have the weekend just the 2 of us yea should be a blast. So I leave my sisters with this prayer i received in an email. I thought you could use a GOD hug. This is my friend, whom I love and this is my prayer for her help her to live to the fullest. Please promote her and cause her to excel above her expectations. Help her to shine in the darkest places where it is impossible to love. Protect her at all times, lift her up when she needs You the most, and let her know she walks with You, she will always be safe. Love to you all God Bless and have a great weekend. Loving this chapter so far! One of my favorite quotes: “You do the things you do because its part of your unique God shaped purpose.” Ironically, I’ve been having daily thoughts/talks with God about my unique gifts. I am not a gifted in the arts or music or writing, teaching…the list could go on. And I always thought the best way and or the only way a person could be “used” is if they had these wonderful gifts. And I do not! God has been showing me throughout the years that we all have special gifts that are perfect for the moment. It could be a smile to a stranger, or listening to a friend. It doesn’t have to be creating a musical masterpiece. Every little wonderful thing that we do, is all part of God. This is how I invision it: if I could create a picture of God with all of the wonderful things people do it makes a picture of Him! It is He is all great and wonderful, not us little ones! Stephanie, thank you for sharing that in God’s big picture,…..that ‘smile to a stranger’, ‘listening to a friend’, sending a note to someone, calling someone, a hand picked bouquet of flowers sent to someone hurting, and so much more, those little things that show Jesus’ love through us to someone, is important to our Father God. Yes, we all have special unique gifts that God gave to each and every one of us, His children. Thank you Stephanie. I love the story Zig Ziglar told about developing men the way gold is mined and how you and your husband incorporated that into your parenting style. I love the color gold so this sentence really stuck out to me – “I see the gold of My image, woven into your heart when I created you. I want to bring it to the surface so others can see it too.” It’s such a good reminder that God has made all of us with beautiful hearts and he wants to show that off to the world so that we can share His love. I really identified with the passage on page 123 about Satan luring us into wanting something, turning it around and then accusing of us on the basis of the very thing he enticed us with. It can be such a vicious cycle and when I get caught in that trap I really do feel like a failure. I am still struggling a bit with the “failing forward” thing. I think I understand it and Suzanne’s post above helped but look forward to discussing it with my small group tonight. Thanks Renee and all of the ladies in this Confident Heart community! I am just now finishing ch. 7 this week (March 8). I got behind since being sick lately. I will get caught up very soon. Question 4 says “Have you ever felt like you fell into one of Satan’s traps?” Yes, many times. “How will you let his accusations lead you to Jesus in the future?” I will pray for Jesus to show me who I am in Him. I know that through GOD ALL THINGS ARE POSSIBLE TO THOSE WHO BELIEVE! That when I fail, I can fail forward. GOD HAS THE FINAL SAY TO WHO I AM, NOT Satan! Question 6 says “Describe a time when you felt condemned (by yourself or someone else).” When Vic condemned me in regards to me not doing what God wanted me to do in making the crosses to sell and who I was suppose to reach at the dialysis center. I was suppose to talk with about God while I was there. “What would the difference have been if you had processed the situation through the filter of conviction instead?” All of the prayer at the end of the chapter spoke to me, however this is what really hit me hard, “I will believe that You delight in me even when I fail or fall. When I have a setback, I will get back up again because You give me Your shield of victory and Your right hand sustains me; Your help makes me great. Thank You for Your grace that is sufficient for me. I choose to rely on Your promise to perfect Your power through my weakness, so that Christ’s power may rest on me. In Jesus’ name I pray, Amen. Question 7 List your personal “failing forward” statements. (a) Failing forward… after I make a mistake at dialysis. (b) Failing forward… after I don’t speak to people who God is in my life when I feel Him prompting me to. (c) Failing forward… after I get behind again on the Bible studies (which includes this one) I am doing. (d) Failing forward… after I miss church again because I am feeling bad again. (e) Failing forward…after I tell God I can’t write another song because it is way too hard. (f) Failing forward…after I also tell God I can’t do the ministry and finishing my teaching certification He wants me to do because I am too sick to do this. (g) Failing forward…after I struggle with losing my other kidney and have all the restrictions I am going to have. (h) Failing forward…after I begin to wonder if I will ever get my kidney transplant. (i) Failing forward…after I feel I have failed God, myself, Vic, and my family. Chapter was uplifting. Somedays seem so mundane at times to me. I am a mom of seven children. But through your book I have learned that I do have spirirtual gifts. For so long I just felt as though I didn’t have anything to share. I am so excited to find out I really do have something to offer to my family and my church. Thanks so much for your time to write this book. It has truly changed my way of thinking. Praying God’s Promises really touched my heart in Chapter 8; especially – I surrender my personality, heart’s desires, abilities, spiritual gifts and experiences to Your purposes. God gave us all of these things so its fitting that we use each of them for His Glory!! !